Another way in to Regina Shober Gray’s diary is through selected entries clustered around the same date. Today is 19 May, so – to pick the arbitrary span of the Civil War years – what sorts of observations does she make in her mid-May entries? A report is very current to-day that Gen.l Beauregard has died of wounds rec’d at the attack on Sumter. Somebody has heard somebody’s letter read, giving an acct. of his funeral!! But I believe it is all a ruse of those tricky Southerners for some deviltry or other! Federal troops are encamped in Baltimore and rec’d with cheers!! Ross Winans the traitor millionaire of B[altimore,] has been arrested for giving “aid & comfort, munitions, &c” to the rebels. Any other government than ours would hang him high as Haman, and confiscate immense wealth – ours will hardly do either – but it would be a salutary lesson to rebel leaders. There is no glory in being hung!! Sunday, 18 May 1862: An excellent sermon from Mr. Foote – “not as the world gives, give I unto you.” It closed with an allusion to the young Mr. Guild who died a fortnight ago. His widow (Mary Thomas) was in her father’s pew – poor young thing, scarce 18 months a wife she has lost one of her twins, and her husband. Sunday, 17 May 1863: A wet, dismal week we have had – and a dull worried one to me. 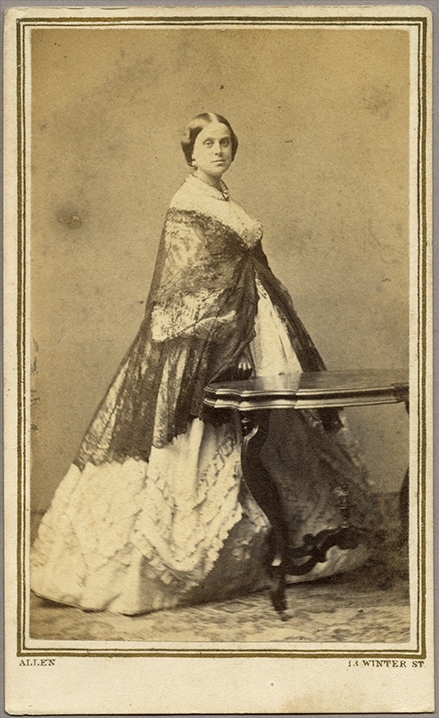 There is so much work unfinished, for which I depended of course on Isabella [Furfey, the Gray family seamstress]. It seems impossible to get it all done in time without her, sew as hard as I may – and unfortunately I cannot sew hard at either the machine or needle, it distresses my head and back so much. Happily this coming week Jane Knight will be here, but after that I do not know where to turn, for sewing help, all the regular people are engaged. …I know that I cannot sit and sew, without suffering for it – that I shall run down in health & spirits and nerves – and that will be poor economy. Yet I feel that I ought to be equal too to doing this simple retrenchment [of reducing her household staff] and that it is very needful – and so the worry goes delving and stunning through my head, and comes no nearer its right conclusion after all. I do not want to say anything about it, till it is settled in my own mind – because I know the families here and in Philad. will oppose the plan. To-day we attended Lieut. Col. Waldo Merriam’s funeral in Arlington St. Church. He was son of our opposite neighbour – a fine fellow who has nobly done his part in this awful war. Came home in 1861 from his European tour, to volunteer for the war. Has been twice at home severely wounded – and had his clothes pierced with bullets often. A brave good man – only 26; but acting Col. of the Mass. 16th for more than a year past. He was killed instantly in Hancock’s splendid charge last Friday. The news came on Saturday – [on] Sunday morning was contradicted – but confirmed again Sunday p.m.
Friday, 19 May 1865: I have just received news of Aunt Regina’s death at about 2.a.m. on Wednesday, May 17.th after a few hours’ illness. She was seized at about her bed-time with one of her attacks of severe pain in the chest, and distress for breath, which soon subsided into total unconsciousness – and at 2 o’c. she passed softly away; her disease is called a congestion of the heart. She has been more or less an invalid all her life – and has long since past her threescore and ten. It is a merciful release. We, like herself, have for years felt the event impending and it can have come to her full only of the richest blessing. What a blessed change for that sensitive trembling spirit, with its morbid dread of the last fearful agony, ever weighing upon it, to have passed “through glory’s morning gate, and waked in Paradise.” I feel so thankful for her that the struggle was not long; that she did not have to suffer for days and weeks, as some do, and watch with failing strength & shrinking spirit the slow approach of that sure friend, whose veiled features show so dark to us, on the “hither side” of the Jordan beyond whose cold wave, we see him to be an angel of light & love. All entries from the Hedwiga Regina Shober Gray diary, R. Stanton Avery Special Collections. The diarist’s youngest son, Morris Gray (1856–1931). He married Flora Grant in 1883. Brigadier General (later General) Pierre Gustave Toutant Beauregard (1818–1893). In 1860 he married Marguerite Caroline Deslonde, sister-in-law of Louisiana Senator and Confederate diplomat John Slidell. Ross Winans (1796–1877), an anti-Federal member of the Maryland House of Delegates, was arrested for the second time following the imposition of martial law on 13 May. In the Bible, the fomenter of a plot of kill the Jews of ancient Persia. Foiled by Queen Esther, Haman was hanged for his crime. The Rev. Henry Wilder Foote (1838–1889), rector of the Gray family church, King’s Chapel, from 1861 until his death. He married Frances Anne Eliot in 1863. Mary Thomas (1834–1915) was married to George Dwight Guild 1860-62 and Dr. William H. Gorham in 1876. Dr. John Ball Brown (1784–1862), “orthopedic surgeon,” died at 8 Joy Street on 14 May. See entry for 20 May 1864. The Rev. Dr. Ezra Stiles Gannett (1801–1871) of the Arlington Street Church. The banker and genealogist James Savage (1784–1873). The household of Mrs. Gray’s unmarried siblings John, Mary, Elizabeth, Susannah, and Sarah Shober. Ulysses S. Grant (1822–1885), Commanding General of the U.S. Army 1864–69. Major General Benjamin Franklin Butler (1818–1893), Governor of Massachusetts 1883–84. Major General (later General of the Army) Philip Henry Sheridan (1831–1888). Major General Franz Sigel (1824–1902). Lieut. Colonel Waldo Merriam (1839–1864). Charles Merriam and Caroline Ware were married in 1829; they lived at 50 Bowdoin Street. Major General Winfield Scott Hancock (1824–1886), a Democratic candidate for the presidency in 1880. Dr. Buckminster Brown (1819–1891), son of Dr. John Ball Brown, married Sarah Alvord Newcomb on 19 May. The diarist’s aunt, Hedwiga Regina Shober (1786–1865). What a touching tribute. You are fortunate to have it. That last entry gave me shivers, and made me sad that so many of us have lost that comforting faith. Thank you for sharing this wonderful diary with us — I do hope you will publish it in full with annotations and genealogical information. And illustrations, lots of illustrations. A magnificent tribute – indeed, few of us have that comfort! Her diary is a rare treasure. I am sad that this is the last entry we’ll see! I’ve really enjoyed reading them!! I will be anxiously waiting for word that the first volume has been published. Thanks for sharing.